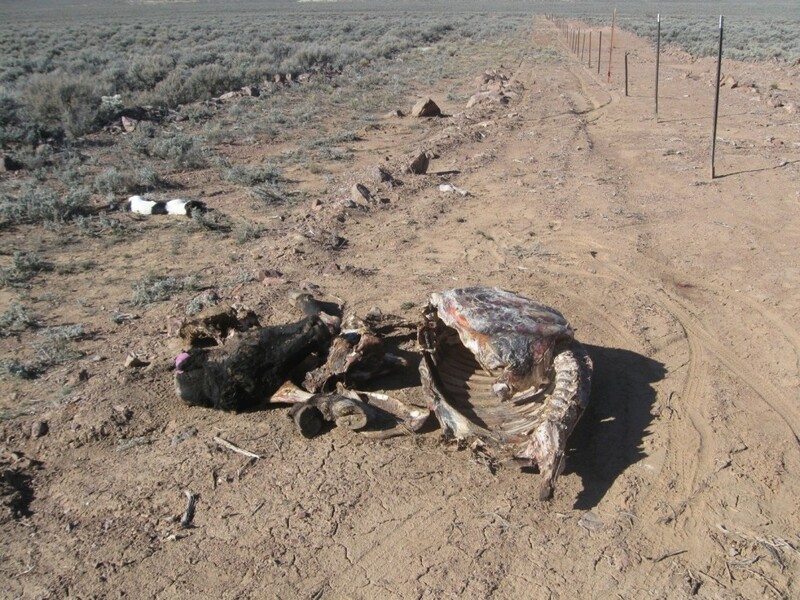 BERYL – A reward is being offered and the public’s help sought in identifying those responsible for killing a dog and skinning and butchering a possibly pregnant cow, then dumping the animals’ carcasses on the side of the road near 3300 West and 800 South in Beryl. According to a press release from the Iron County Sheriff’s Office, the animals were found by members of a fence crew who were working near the location on Feb. 10. The crew had been working the entire strip of road the day before, Iron County Sheriff’s Sgt. Nik Johnson said. When they came back to finish their work the following morning, they discovered the carcasses, which had not been there the previous day. 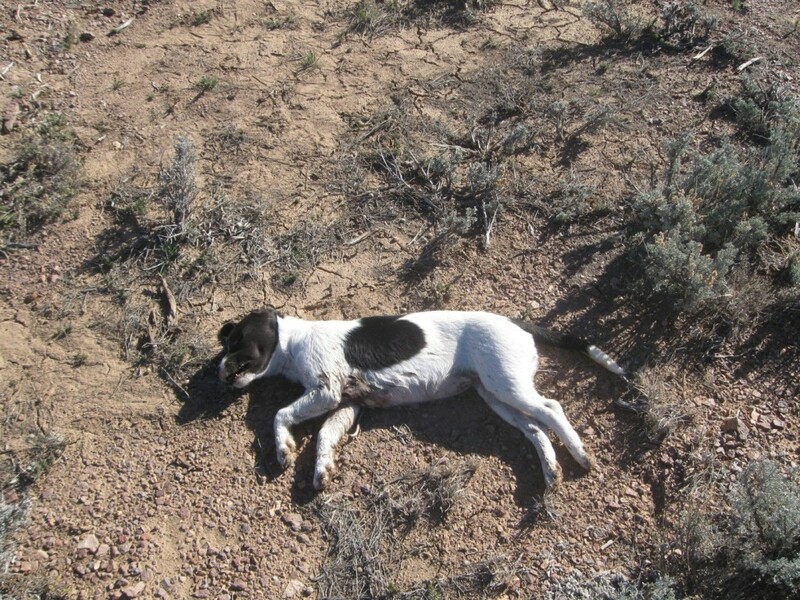 The dog died from an apparent gunshot wound, and it is presumed the cow died in the same manner, the release reported. The cow had been stripped clean and all the usable meat removed before the animal’s remains were disposed of. The Sheriff’s Office estimated the dumping occurred between 7 p.m. on Feb. 9 and 9 a.m. on Feb. 10. It is believed the dog was killed on-site and the cow was killed near Sand Springs Road and Sand Well Loop by Newcastle. Though investigators know who the cow belonged to, they are still in the dark about who owned the dog, Johnson said. According to the press release, the value of the cow was estimated to be between $1,700-$3,000. The value range is broad because it is unknown whether the cow was pregnant at the time of the shooting or had calved prior to being stolen and butchered, Johnson said. If she was pregnant, she would have been worth closer to $3,000. The Iron County Sheriff’s Office is offering a $1,000 reward for information leading to the arrests and convictions of any suspects in this case. Anyone with information should contact the Sheriff’s Office at 435-867-7500 or follow this link and fill out the form. Images below are graphic in nature. Well the cow was gonna get eaten anyway, right? And maybe the dog was rabid and had to be put down? The cow was stolen, possibly pregnant, so no it would not have likely been eaten right away. . . then it’s found near the body of a dead dog. These are the kind of crimes future/ current murderers and psychos commit. They have no regard for life. possibly something satanic involved here? Crazy stuff! Must of been a busy night out in the country………. The “people” who did this are on par with crack dealers and pedophiles. Next time you have the urge, do us all a favor and just off yourself instead. I will even buy the bullet.